We’d love your help. Let us know what’s wrong with this preview of A Fall from Yesterday by Norah Wilson. Ocean Siliker has come back to Harkness, New Brunswick in defeat, after failing to set New York on fire with her playwriting. The first item on her agenda? Climbing White Crow Cliff, where her best friend Lacey Douglas died six years ago. If she conquers the mountain, perhaps she can rediscover her courage. But the only thing she finds herself is…lost. Family obligations h Ocean Siliker has come back to Harkness, New Brunswick in defeat, after failing to set New York on fire with her playwriting. The first item on her agenda? Climbing White Crow Cliff, where her best friend Lacey Douglas died six years ago. If she conquers the mountain, perhaps she can rediscover her courage. But the only thing she finds herself is…lost. Family obligations have left Titus Standish stuck in Harkness. While his younger siblings went off into the world, he stayed, working the farm and running the local search and rescue. He was there when Lacey fell to her death and blames himself. He dreads the day another mission takes him up there again. But when Ocean’s mother calls, concerned that her daughter is wandering the mountain, he leaps into action. To ask other readers questions about A Fall from Yesterday, please sign up. Norah Wilson graces her reader base with a brand new contemporary romance series in a small town setting with the first book in The Standish Clan series, A Fall from Yesterday. Featuring Titus Leigh Standish as the hero and Ocean Silkier as the heroine, Norah takes readers through what familial obligations can do to dreams a person may harbor and what may come of it. In the Standish family, Titus had been the one who had been held back, dreams of his own that had been squashed in keeping up with Norah Wilson graces her reader base with a brand new contemporary romance series in a small town setting with the first book in The Standish Clan series, A Fall from Yesterday. Featuring Titus Leigh Standish as the hero and Ocean Silkier as the heroine, Norah takes readers through what familial obligations can do to dreams a person may harbor and what may come of it. In the Standish family, Titus had been the one who had been held back, dreams of his own that had been squashed in keeping up with the responsibilities at home that he couldn’t have walked away from. Now that life has more or less settled down and he is no longer required to stay put, Titus is determined that he would pursue his dreams. Tthat means leaving his hometown and venturing outside of the life that he has known, something that excites him on one level while he dreads letting everyone else know of the decision that he has made. The Thanksgiving weekend was supposed to be the opportunity for coming out with the news. But Titus is called out on a search and rescue mission with none other than Ocean Silkier, a woman who occupies more of his thoughts than he would like to admit, being the one in need of rescuing. Ocean is determined she would make the climb to the White Crow Cliff, if nothing else, for her best friend who had lost her life while on the very same climb. Ocean has returned home after chasing her ambitions in New York. Believing herself to be a failure is what makes Ocean attempt the climb, a way to prove to herself that she won’t give up on what she wants to do. But alas, when Ocean finds herself dealing with more than she bargained for, it is Titus Standish who turns up, and with him comes to the forefront, the yearning for him that she has held back all her life. What I could relate to most about the story was where Titus was coming from. The fact that obligations have a way of holding you back in ways you never would have dreamed possible. Of course, people always say that where there is a will, there is a way. But sometimes, all your energy is spent on just surviving current conditions and until the situation improves, you are bound helplessly to whatever it is that is tying you down. People who are free to do as they please, seldom understand the concept of being tied down. But it made me respect Titus all the more because it would not have been easy to watch his siblings pursue whatever dreams they had and achieve them while he stayed back and manned the fort. For others to follow their dreams, someone else always has to forgo and give up theirs so that those that do, can do so guilt free. The ending when it came, carried a message that was very worthwhile as well. Sometimes we can get so hung up on dreams that are fueled by needs, not do much to do with our wants, but rather made so because we believe it is what we SHOULD want. Titus learning what is actually important to him and being true to that, made the story for me. Ocean too, found within her the strength to look into what has been holding her back. I guess it is more of how much of yourself you are willing to give to become what you want than where you go to do so. That in essence, was the lesson and message I received from A Fall from Yesterday. Recommended for those that love contemporary romances in small town settings. Titus has been working his family's land since his siblings went off and chased their dreams, but Titus stayed on the farm. His dad has agreed to sell and now the siblings are coming home and they will learn the fate of the farm, but first Titus must go out on a rescue mission - to the one spot he made a mistake he can never forgive himself for. Titus is a quiet hero, I am not even sure if he sees himself as someone women would be interested in. He is focused on a dream he is trying to realize, but his moral code wont let him pursue. I have to say I kept on thinking of George Bailey in "It's A Wonderful Life" whenever Titus talked of needing to get out of town and finally chasing his dreams. Like George, Titus put the needs of others over his own. He is a caring man, one who takes great responsibilty for others. Ocean is a heroine many can relate to, she is picking up the pieces when her career, her calling, didn't seem to work out. She has loved Titus most of her life, but figures he never knew. just another thing she failed at; her career, her love life and her friend. Titus is called to rescue a hiker, and finds it is Ocean. The last person he would ever want to see on the mountain, as she is a glaring reminder of his failure. Ocean has issues she is trying to move past with the hike. Determination beats out common sense and from that brings closure to both Ocean and Titus. This was my absolute favorite part of the story. Yes this a book is about a hike in the woods and selling the family farm, but it is so much more. There is tenderness, some steam, wisecracks, telling of old tales, a little mystery and a few setups for future books. A Fall From Yesterday is the first book in what looks to be a series about Harkness and the Standish Family. This book centers around Titus and Ocean who grew up in the same small town. Ocean was a few years younger than Titus and has always had a crush on him. Ocean left to pursue her dream to be a play write in New York while Titus was forced to put his dreams on hold and help out on his families farm. Ocean is finally back for good but Titus finally has the opportunity to leave and follow his A Fall From Yesterday is the first book in what looks to be a series about Harkness and the Standish Family. This book centers around Titus and Ocean who grew up in the same small town. Ocean was a few years younger than Titus and has always had a crush on him. Ocean left to pursue her dream to be a play write in New York while Titus was forced to put his dreams on hold and help out on his families farm. Ocean is finally back for good but Titus finally has the opportunity to leave and follow his dreams. Both Ocean and Titus end up in a situation where they are able to face a difficult event in the past that has shaped both their lives. As they spend time together Ocean realizes her feelings for Titus have only grown and Titus sees the woman that Ocean has become. The attraction grows but they both have some hurdles to get through before they can decide if they want to make a go of a relationship. I really enjoyed both Titus and Ocean and this sweet romance. I liked that Titus was finally following his own dream but the author did a great job of showing his guilt about leaving his family and the town he grew up in behind. Both characters showed a lot of growth through the story and I enjoyed the introduction of the secondary characters. This book had an HFN ending but one of the plot lines will continue in the next book which I look forward to reading. Such a sweet wonderful story!!! This was such a great book with lots of chemistry, adventure, great characters and story line. I loved Titus and Ocean! And I really loved the scene at Crooked Man's Cave...sigh. I fell in love with the whole family and town and I cannot wait to read the next books in the series to find out what happens with the siblings and the homestead...and I think their Dad may have some love interest going on too. Such a feel good story! I received an ARC copy of this book f Such a sweet wonderful story!!! This was such a great book with lots of chemistry, adventure, great characters and story line. I loved Titus and Ocean! And I really loved the scene at Crooked Man's Cave...sigh. I fell in love with the whole family and town and I cannot wait to read the next books in the series to find out what happens with the siblings and the homestead...and I think their Dad may have some love interest going on too. Such a feel good story! I received an ARC copy of this book for my review and I absolutely loved it and HIGHLY recommend it for a wonderful and romantic good read! Enjoy, I know I did! This is the first book that I have read by Norah Wilson and all I can say is that I will be reading more by this author. This book hooked me from the very beginning and I couldn't wait to see what happened between Ocean and Titus. Ocean is just returning home from New York and her writing career and Titus will be leaving soon to do what he has always dreamed of doing. Ocean and Titus face things from their past together and realize that their dreams of the future may not be what they truly want This is the first book that I have read by Norah Wilson and all I can say is that I will be reading more by this author. This book hooked me from the very beginning and I couldn't wait to see what happened between Ocean and Titus. Ocean and Titus face things from their past together and realize that their dreams of the future may not be what they truly want any longer. This is the first book in a brand new contemporary romance series...and wow, this series started off with a fabulous book! Titus is the oldest of the Standish siblings and he's spent the last ten years taking care of the family farm and not following his dreams. He can't do it anymore and has brought his two siblings home to let them know that the sale on the farm is happening the next week. But before he can, he has to go out on a search and rescue on the mountain...he's not sad about the temporary reprieve. He's going out to rescue Ocean. Ocean has had a crush on Titus since she was in elementary school. She's just given up on her following her dream of becoming a broadway screenwriter and is now home...where it's time for her to confront the tragic death of her best friend on this mountain six years before. This book was so interesting just because, on paper, these two people are going in completely different directions. Titus is leaving home to follow his dreams. Ocean is back home having given up on her dreams. But they connect on the mountain. They are both haunted by Lacey's death...Titus was the one trying to rescue her when she died. The revelations about that death, while heartbreaking, added so much to this story. And there is a TON to this story. There's a beautiful connection which happens between Titus and Ocean on the mountain. But the story doesn't end on the mountain. There's so much going on for both these characters that continues when they get home. There's a great balance to the story...LOTS happening in the background, but the focus stays on the developing relationship between Ocean and Titus. And despite the fact that they know it won't continue, they do have a really beautiful, romantic story. I love how they start out...it's a very contentious place since Titus wants her off the mountain, but Ocean hasn't finished her quest, so she refuses to give up. But there's a respect between them that makes the story work so well. I loved them! But there's so much more to come in this story. Ember, Titus's sister, disappears with the enemy in this story and it's never revealed where she was and what exactly she's been doing. What will happen to the family farm? Because you know those two things are tied together and will be part of an upcoming story. I cannot wait to read more. I fell in love with this family...Titus, Scott, Ember, and their father Arden. I received an ARC for an honest review. I found this to be a sweet hometown romance revolving around the Standish family. It is a story about living your dreams and following your heart. Titus Standish has lived in Harkness all his life. Even with his dreams of leaving town, he is still there taking care of his family and the people of the town. He feels like he has been left behind while he waits his turn to do what he wants in life. Titus’ chance finally comes to follow his dreams, when he gets I received an ARC for an honest review. I found this to be a sweet hometown romance revolving around the Standish family. It is a story about living your dreams and following your heart. Titus Standish has lived in Harkness all his life. Even with his dreams of leaving town, he is still there taking care of his family and the people of the town. He feels like he has been left behind while he waits his turn to do what he wants in life. Titus’ chance finally comes to follow his dreams, when he gets a rescue call that has him hiking up the mountain. He finds Ocean Siliker, the girl he’s known since he was a kid, all grown up. Ocean has come back to town feeling like a failure. She left town with big plans, but things haven’t worked out like she planned. To find herself again, Ocean decides to climb the mountain where her best friend lost her life. She doesn’t want to give up even when she gets lost. Help arrives in the form of Titus, the guy she’s had a crush on since she was a teenager. Is this her chance to finally follow through with her feelings? This first book in the series is a very interesting journey not only for the main characters but for the secondary characters as well. They all are presently going through their own journeys and discoveries – some longer and more challenging than others. I loved Titus and Ocean together although Titus’ character frustrated me many, many times. I guess you can blame it on the fact that he’s a man :). They made a great couple and Ocean truly completed Titus. I also loved Ocean’s mother – very wise This first book in the series is a very interesting journey not only for the main characters but for the secondary characters as well. They all are presently going through their own journeys and discoveries – some longer and more challenging than others. I loved Titus and Ocean together although Titus’ character frustrated me many, many times. I guess you can blame it on the fact that he’s a man :). They made a great couple and Ocean truly completed Titus. I also loved Ocean’s mother – very wise, and very perceptive. This story truly kept my interest even though my forte is to read romantic suspense and action. The stories started with the secondary characters truly make me want to return to Harkness, New Brunswick. A lovely story of forgiveness and hope! I really enjoy Norah Wilson's books, They are always well written and filled with romance. 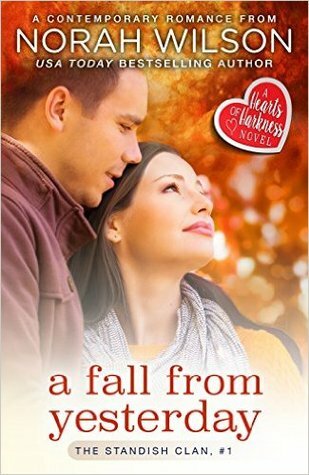 A Fall from Yesterday: A Hearts of Harkness Romance, is the perfect introduction to her new series The Standish Clan! I loved her charming characters Ocean, what a lovely name and Titus. It tells a story about love and forgiveness! Their story is a little complex, but when they finally realize they were meant for each other, they'll live a full and happy life together. A lovely story of forgiveness and hope! I loved her charming characters Ocean, what a lovely name and Titus. It tells a story about love and forgiveness! Their story is a little complex, but when they finally realize they were meant for each other, they'll live a full and happy life together. It's also about family relationship intertwined into Ocean and Titus's lives. Next story, to watch for, in this series: Ember's Fire. A wonderful story and the start of what should be a fantastic series. This story is filled with wonderfully bold characters, adventure, romance and family. Ocean and Titus were wonderful together with terrific chemistry between them. Both determined and headstrong but the longer they spend time together the more understanding they become. A great read I would definitely recommend. A really refreshing twist on a small town romance, lots of adventure included as Titus and Ocean climb the mountain that guards their small town. This Texas girl learned a lot about mountain climbing, too! I really enjoyed this book, especially the journey Titus and Ocean make together, each rescuing the other from the seemingly insurmountable “mountain” blocking the path to their future. They help the other “find” themselves and the missing pieces for a blissful present and promising future. Titus is the oldest son who gave up his chance to pursue his lifelong goal in order to take over the family farm when his mom got sick, not once but twice, and stayed on while his dad tried to deal with his I really enjoyed this book, especially the journey Titus and Ocean make together, each rescuing the other from the seemingly insurmountable “mountain” blocking the path to their future. They help the other “find” themselves and the missing pieces for a blissful present and promising future. Titus is the oldest son who gave up his chance to pursue his lifelong goal in order to take over the family farm when his mom got sick, not once but twice, and stayed on while his dad tried to deal with his grief. A couple of years later, when Arden offered to sell it, Titus takes him up on it, with a buyer in mind. He’s going to pursue his goal to become a RCMP. After all, the add says RCMP are looking for more mature candidates these days. And, he once again got accepted. This story picks with Titus calling younger sister Ember and adopted brother/cousin Scott home for Thanksgiving to tell them that the land deal is done and they have to be out by the end of the month. Unfortunately, Titus he won’t be there to finish it out. He’s gotta leave for police training before the deadline. Ocean Siliker has been attracted to Titus since their very first meeting, and has had a crush on him since elementary school. No one in town was surprise when the girl who got excited about literature assignments announced her plans to become a professional be a writer. She’s been living in NYC with roommates trying to make it since school, watching several of those roommates make it. But as a precaution, she tries to call her mom as she starts up the trail. But service cell service is spotty at best. She can hear Mrs. Siliker but isn’t sure what her mom hears. Mrs. Siliker, worried for the daughter she can’t hear but sure she’s headed up the mountain, calls rescue and the Standishs mobilize. And wouldn’t ya know, she’s gotten off path trying to get a signal to talk to her mom. Things progress from there, but both have to put the past to rest and deal with the future which is bearing down at warp speed. Both have issues about the friend’s death they have to let go, and each has had their own share of struggle the last few years. Then, there’s the fact that Titus is planning to leave PDQ. My one complaint with “A Fall From Yesterday” was that it left so many things hanging. Yes, Titus and Ocean get their HEA, but whatever becomes of MIA Ember and the injured yet cunning Jace, Uncle Arden and Fay Siliker? What’s next for Scott the wanderer and the source of those mysterious phone calls he’s been getting? What about the farm and the development group that bought it? All of these secondary characters are engaging and have their own demons and trials to conquer. I’ve no doubt Titus and Ocean will weather whatever storm life tosses their way, together. There were just so many loose ends. Titus Standish is finally ready to do what he has always wanted. He’s been accepted into the RCMP (Royal Canadian Mounted Police) program, which has been a life-long dream. He’s called in his siblings to tell them that not only is he leaving, but that his dad has agreed to sell the farm. As his brother, Scott, and sister, Ember, both arrive home, there are a couple of people up on Harkness Mountain that are in need. Titus has been part of the search and rescue team there forever, but there’s no way he can be in two places at one time. When their dad steps in and says that Titus is to go after Ocean Siliker and Ember will hike in to help a guy stranded at a cabin, neither Titus nor Scott is happy. But, as their dad point’s out that their sister is no longer a child and that she has her medical degree, they know they’ve lost the battle. All three head to the mountain with Scott waiting at the base as backup as Ember and Titus head up the mountain. Little did they know this day would change everything………..
A Fall from Yesterday is a nicely written story. Titus Standish is an amazing character. He’s done a lot for his family, putting his own plans on hold, and has always put everyone else first, until now. Yet, he still feels guilty. Ocean was a good one as well. Even though she came home with her tail tucked, she’s determined to make something of herself. She’s just not sure what that something is. The supporting characters are wonderfully written as well, and I cannot wait to read more about them. I wasn’t a fan of how Ms. Wilson left everything hanging with regards to them, but I know she was just setting up the next book. A Fall from Yesterday is ultimately a story about making peace with one’s past and preconceived notions about your future to truly forge ahead and do what truly makes you happy. This is the first book I’ve read by Ms. Wilson, but it won’t be the last. Well done, Norah Wilson! Very well done! Book introduces a family living in a rural community. Nice people going through uncomfortable changes, finding it difficult. This is the first book in a contemporary series. It was sweet rather than compelling, well written, an easy and comfortable read. To start this off, I got this book because of Goodreads Giveaways and it hasn't influenced my opinion. What I liked about this book was that besides the romance the author added in both characters getting over the death of Lacey. I liked the metaphor of climbing the mountain to get over their separate fears and worries. What I didn't like about this book was the way it ended. I won't post it here because it would be spoiling it, but there are certain things that happen the way they do that I don' To start this off, I got this book because of Goodreads Giveaways and it hasn't influenced my opinion. I thought these was a great story I enjoyed reading it. I love Norah Wilson's books.